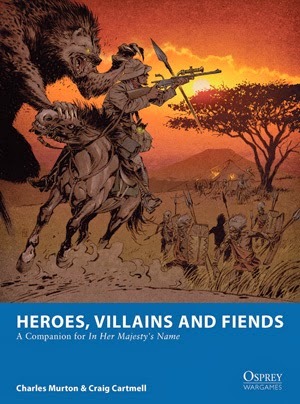 Recently sought out the 'In Her Majesty's Name' rules and 'Heroes, Villains and Fiends' companion book after hearing Mark and Matt talking about them as a possible future project. 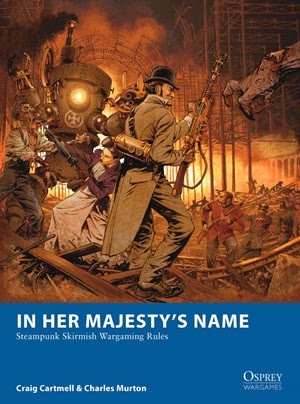 Written by Craig Cartmell and Charles Murton and released by Osprey. I sourced the books as electronic downloads from Amazon, in Kindle format, and coming in at around the £10 mark which is about the same cost as a single pdf\ePub format copy from the Osprey site. The pitch of the game seems to be small scale, showing a more pulpish feel, with a bit of steampunk tech thrown in, than grandiose ubertech like in Spartan Games Dystopian Wars. The closest comparison I can think of is Legends of the Old West (from the defunct GW Historical), with a small amount of Space 1889 Soldier's Companion. Being a small ruleset the authors are open in stating the nature of the rules, that it can't cover everything, and players should come to agreement about things that fall out side the norm. So, in common with rules like Black Powder, it's as much a toolbox as a full game. Rules seem simple enough, and crib sheet section at the back helps keep modifiers at hand. Most actions can be resolved within 2 dice roles. A turn could take a long time given the one figure at a time movement resolution, which is then repeated for shooting and melee. Plus it could put larger companies at an advantage as a horde would always get the last moves - presumably the points costs take this into account. The companion book is mostly concerned with describing new adventuring groups and minor additions to equipment lists and abilities. It does expand the world and related fluff quite a bit, heading to the Continent, (mostly north) America, and Africa and remains playful in its descriptions despite some vanilla lists. The expanded campaign rules at the back introduces the idea of a mutually created narrative campaign. The concept is a good one, but the actual details for running it is a bit slim. The main trouble with organising such a campaign is getting the players to engage their imaginations to get a decent set of alternative scenarios. Points management in campaigns is not defined much other than as absolutes - given the possible permutations selectable, maintaining a campaign roster is not full explained. It'll be up to organisers to set the campaign rules. There seems to be plenty of support for the game, with other expansions on the way and an official miniature range from North Star. Plus it's generated quite a bit of activity on various forums such as at Lead Adventure where the authors often post. Surprisingly, for an eBook of this type, I found it easier to read and navigate the books on my old style Kindle than on my Android's Kindle app. The text just seemed to flow better, and the pictures are superfluous to the rules themselves, no fancy diagrams on display, which was always the Kindles weak spot due to lack of contrast and grey scaling merging everything.